Lunch has never been my favorite meal and I think I know why. At home on the weekends, it seems to be more of a chore than anything else. The girls are usually not starving, because they had a late breakfast – and they never know what to eat. If it were up to them they would have a brunch every day – with eggs, pancakes, bacon, etc… At work, although I am starving, I have to force myself to get to the cafeteria just to get something healthy in my body. Then I just march back up the five flights of stairs just to sit in my office and eat while I catch up on email. How is that healthy? When I am traveling in Europe it is completely different. 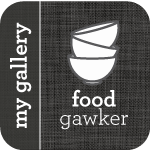 Even when I am in the office we take the time to go to the cafeteria and sit down and eat – that is if we don’t get out of the building and eat somewhere else. Even when we have meetings, we take the time to have lunch. When I studied there during college, I remember that was the only meal that I didn’t eat with my French family – that was their family time – the kids left school to go home for lunch, and that was the big meal of the day. It makes sense – you have hours to burn off the food and then you eat a light dinner before going to bed. When I am home on the weekends, my go-to-lunch is an egg sandwich. I tend not to eat eggs for breakfast, but by lunch time that is exactly what I need. I have been staring at the lentils in my pantry for quite a while now, when this recipe flew out of the stacked pile from Cooking Light. A big light bulb went off in my head. 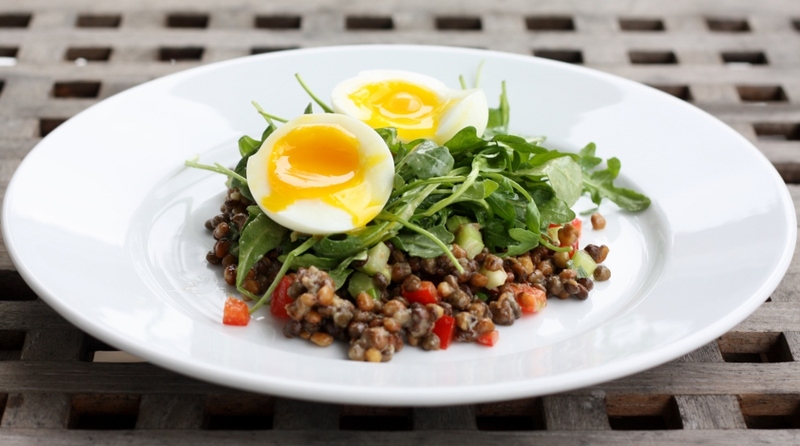 Instead of my typical egg sandwich, why not take the time to make this lentil salad that I can enjoy a few times this week, and cook a soft boiled egg to go on top – just like the beautiful picture next to the recipe. I swear, it was calling me. Place lentils in a medium saucepan. Cover with water to 3 inches above lentils; bring to a boil. Reduce heat, and simmer 20 minutes or until lentils are tender. Drain and keep warm. Add water to a large saucepan to a depth of 3 inches; bring to a boil. Add eggs; boil 5 minutes and 30 seconds. Drain. Plunge eggs into ice water; let stand 5 minutes. Drain and peel. Combine oil, vinegar, mustard, garlic, salt, and 1/4 teaspoon black pepper in a medium bowl, stirring with a whisk. Set aside 2 tablespoons oil mixture. Add lentils, bell pepper, onions, and celery to remaining oil mixture; toss gently to coat. Place reserved 2 tablespoons oil mixture and arugula in a large bowl; toss to coat. Place about 3/4 cup lentil mixture and about 1 cup arugula mixture on each of 6 plates. Cut eggs in half lengthwise; top each serving with 2 egg halves. Sprinkle evenly with remaining 1/8 teaspoon black pepper. I would love this for my lunch and I guess if you were home it would be easier than trying to bring this into work, because of the eggs. I know I used to always work through lunch too. I am sure it is not healthy for you. Now that I am living in HK everyone takes a lunch break, usually from 1p to 2 pm and takes time just to eat. What a novel idea. I made something very similar a little while back and I totally forgot about it. Now you have me craving it again. The egg with lentils is just perfect! Great lunch idea! I too am not much of a lunch eater. Mostly I just never have time or I forgot my leftovers. ;) Have a great week Dawn! I look forward to making this dish soon! Oh my this looks decadent!